1 The UE Megaboom Spec. The UE Megaboom is among the easier to recommend products due to its super sound and better life compared to the smaller Boom brethren. At $299, the speaker is a great looking product. It keeps impressing with the great performance, waterproofing and other unique features that the free companion app allows. To make the product better, you just need to get more of it. UE Megaboom is a bigger Boom 2 and that alone makes it a better recommendation among the pack. By digging in deeper, the plus-sized device sounds fuller and louder than the small next of kin. Its large form factor allows its battery life to stretch for around 20 hours, nearly 25 percent longer than the Boom 2 manages. With the many improvements, the Megaboom is worth its current price. If you need more power, it is the product to go for. As you expect, Megaboom dwarfs the Boom 2 device in size and lies on the high side for the portable speakers. It is slightly below nine inches and around two inches above the UE Boom 2 and an inch thicker. Apart from the different dimensions, it retains the original compact cylindrical charm. 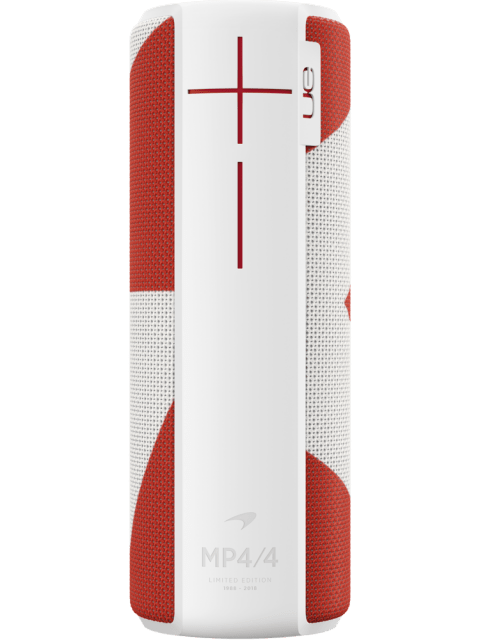 Unlike the first-generation products, the UE Megaboom has a great design – most likely, you will realize that the design has not changed. The product features the familiar “-, +” volume buttons situated on the front side and its power button rests at the middle of its concave top. It boasts the size of large thermos, considering the design elements on the original Boom and the successor. The fabric stitching, which wraps around the body, has sparse thread count and a button design mimicking the appearance of the UE Boom. But after you flip over the device, the port flap, which assists the product in waterproofing efforts goes under the knife and the Megaboom appears flatter like the Boom 2. The manufacturer did a lot of work to come out with the excellent design and the same applied in the performance part. Apart from the ease of use, the plus-sized speaker provides measurable boost in battery performance and sound, which in addition to helping it standout out among the small kin; they have helped it reach the eye-level of the leading competitors. The product has a powerful sound full of heady bass and crispness. 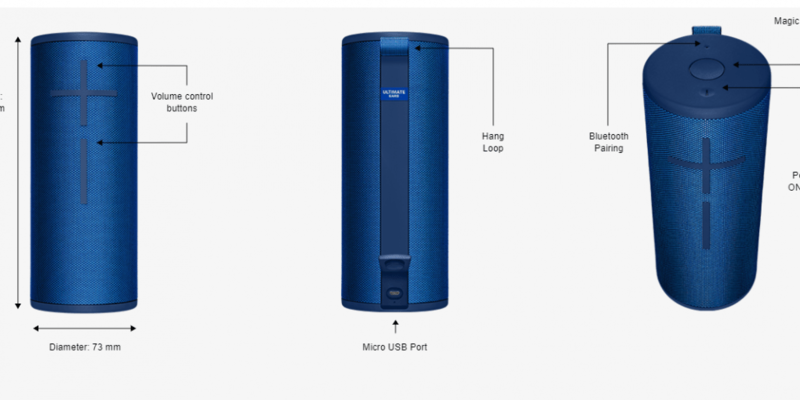 It provides full room-filling experience, which has been an important part of the cylindrical Bluetooth speakers UE provides. The large hardware is as worthy as the accolade. You might be a lover of various music genres but anything you play will sound expansive and vibrant. UE Megaboom’s 360-audio effect – which the manufacturer has highly improved from that you expect with Boom 2 – is notably great. Each time you get closer to the speaker, you will realize it is harder than the previous two. That does not mean that you will not find any dead spot in delivery of the sound. The Megaboom will please listeners who believe that the worthy speakers are those with many features. Just like the other speakers on the UE’s lineup, the Megaboom has many capabilities nestled in the free companion app. The app might not be an important tool for most music enthusiasts, but it comes with many unique features. A quick example: you can tweak the built-in equalizer to match your preferences. You can also pair over two UE speakers together for greater performance. Moreover, the app will help you set personalized alarms for this Megaboom – you will enjoy waking up to your most favourite music. After the purchase, you will be able to invite the friends within the device’s range to connect and make more song suggestions through the Block Party feature. The large speaker also provides numerous practical features. You can answer calls by pressing its Bluetooth paring button – to hang up a call you will just need to do the same. The sound quality from calls and the speaker’s microphone pickup will leave nothing to be desired. Unlike the smaller UE speakers, Megaboom’s battery lasts for five more hours – totalling to 20 hours. That puts it within the range of what speakers of similar price and size should offer. Finally, the waterproofing features do a great job to protect the innards for roughly 30 minutes when submerged in water. If you are like me, you are unlikely to take such a dip. It will handle a plunge into your kitchen sink excellently. The Megaboom offers incredibly sounding bass. In other words, you will be able to follow the bass-heavy tracks that other speakers cannot handle easily. The manufacturer improved the highs and Mids to facilitate better management of audio balance. The Mids are now more accurate and you should expect most instruments to sound perfect. The clarity of the highs enhances high-end details to a near perfect point. The speaker sounds better than the Booms, but has downsides, which are noticeable at high volume levels. It can handle any genre but it struggles with louder heavy rock tracks and metal. The Megaboom speaker features a longer Bluetooth range that will help you establish and maintain connections around 100-105 feet. You should expect dropouts in the 105 feet range but the music will be listenable. The Smart Bluetooth allows the user to control the speaker through a smartphone app, which also allows setup of two speakers – including with the od Boom – as stereo speakers, to adjust the equalizer, to turn the device on/off and to sync up several speakers to augment music sounds. Upgrade from the smaller speakers to the UE Megaboom might not be an absolute necessity, unless you need more power. Even though its price is higher, the speaker is awesome. The greatest downside of this product is the app. The manufacturer might need to release a better app with the future products.